1) Bize, P.E., Platon, A., Becker, C.D., et al. 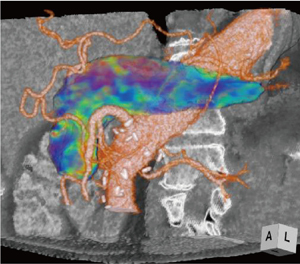 ： Perfusion measurement in acute pancreatitis using dynamic perfusion MDCT. Am. J. Roentgenol., 186, 114〜118, 2006. 2) Tsuji, Y., Yamamoto, H., Yazumi, S., et al. ：Perfusion computerized tomography can predict pancreatic necrosis in early stages of severe acute pancreatitis. Clin. Gastroenterol. Hepatol., 5, 1484〜1492, 2007. 3) Watanabe, T., Tsuji, Y., Kodama, Y., et al. ：Relationship between serum angiopoietin-2 level and perfusion CT parameters in severe acute pancreatitis. Am. J. Gastroenterol., 2011（in press）. 4) Delrue, L., Blanckaert, P., Mertens, D., et al. ： Tissue perfusion in pathologies of the pancreas ; Assessment using 128-slice computed tomography. Abdom. Imaging, 2011（Epub ahead of print）. 5) Hirota, M., Tsuda, M., Tsuji, Y., et al. 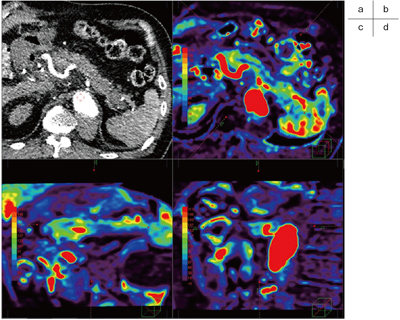 ： Perfusion computed tomography findings of autoimmune pancreatitis. Pancreas., 2011（Epub ahead of print）. 6) Yu, C.W., Shih, T.T., Hsu, C.Y., et al. ： Correlation between pancreatic microcirculation and type 2 diabetes in patients with coronary artery disease ; Dynamic contrast-enhanced MR imaging. Radiology, 252, 704〜711, 2009. 7) Park, M.S., Klotz, E., Kim, M.J., et al. ： Perfusion CT ; Noninvasive surrogate marker for stratification of pancreatic cancer response to concurrent chemo- and radiation therapy. Radiology, 250, 110〜117, 2009. 8) Bali, M.A., Metens, T., Denolin, V., et al. ： Tumoral and nontumoral pancreas ; Correlation between quantitative dynamic contrast-enhanced MR imaging and histopathologic parameters. Radiology, 261, 456〜466, 2011. 9) Tsuji, Y., Takahashi, N., Chiba, T. ： Pancreatic perfusion CT in early stage of severe acute pancreatitis. International Journal of Inflammation, 2012（in press）. 10) Kambadakone, A.R., Sharma, A., Catalano, O.A., et al. ： Protocol modifications for CT perfusion （CTp）examinations of abdomen-pelvic tumors ; Impact on radiation dose and data processing time. Eur. Radiol., 21・6, 1293〜1300, 2011.